Ethiopian New Year (Enqutatsh): This is celebrated every September 11. It is the major holiday of Ethiopia where we still retains the Julian calendar and the sun comes out to shine all day long creating an atmosphere of dazzling clarity and fresh clean air after big rainy season. Meskal (Finding of the True Cross): It is celebrated every September 27.Meskel commemorates the finding of the True Cross in the fourth century AD when Empress Helena, Mother of Constantine the Great, discover the True Cross on which Christ was crucified. The celebration of Meskel signifies the presence of the True Cross at Gishen Mariam monastery and also symbolizes the event carried out by Empress Helena. Meskel is celebrated by dancing, feasting and lighting a massive bonfire known in Ethiopian tradition as Demmera. Lidet (Ethiopian Christmas): Lidet falls on December 29th on the Ethiopian calendar (January 7th on the Gregorian calendar). It is celebrated with a spectacular procession, which begins at 6 am and lasts until 9 am. Christmas is so special nowadays at lalibela. Timket (Epiphany): Timket, or the Feast of the Epiphany, is celebrated in the 19 January of each year. 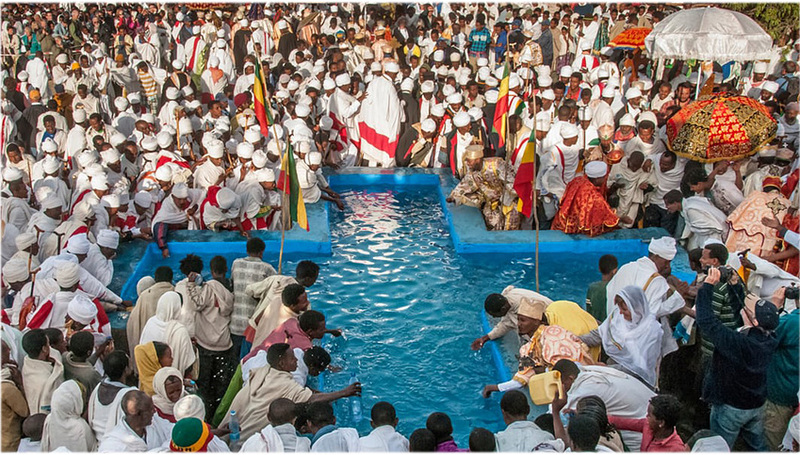 The 3-day event commemorates the baptism of Christ and is one of the most colorful Ethiopian festivals.